Anyway, maybe doing a little research is a better idea after all, hence this post. 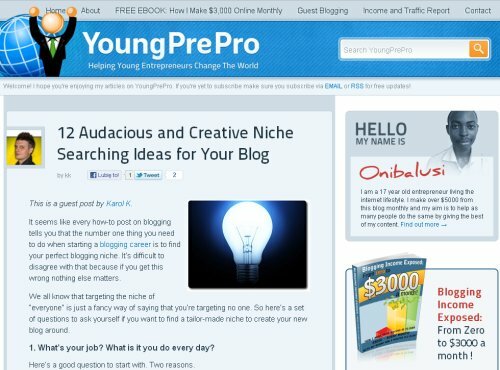 To find out what I’m on about feel free to check out my guest post at YoungPrePro. Once you have your niche there are still some things yet to do. For example, you have to decide which domain is right for you, you have to find a WordPress theme (remember, free WordPress themes are evil), and last but certainly not least – you have to find some blog traffic sources. Can’t Find a Niche? Create a Fake One!